74% of consumers who search for an attorney online end up calling them on the phone according to FindLaw. If you know that three out of every four prospects will call you after visiting your page, the only question left is what is the best strategy to get these prospects to your website. To help you, we discuss the benefits and drawbacks of using both SEO vs PPC to market your law firm. It is a legal marketing battle royale between two stalwart traffic generating strategies. Understanding how SEO and PPC work is the first step in creating an effective traffic strategy for your legal website. Before you create an organic or paid search strategy, you need to understand the state of your market. Despite reciprocity laws, most attorneys practice locally. Therefore, you need to know what competitors you have in the area as well as which competitors are in your specific field of law(niche). 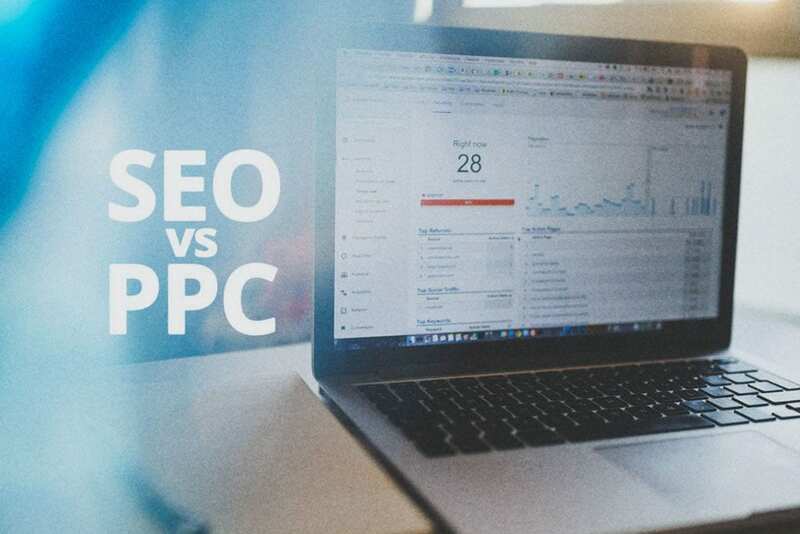 When comparing SEO vs PPC you discover a number of advantages and disadvantages. To help you explore which strategy works best for you start by examining how other practices in your nicheuse SEO, PPC, or a combination of the two. Does your firm serve an area with a population between 50,000 – 500,000 people? If your competitors are not working with SEO gurus, most likely they are not, then SEO is a great marketing channel for you if you have time to grow your firm. The drawback forSEO is when you have to compete against the whales in your industry. You can spend $5,000 or more per month to drive a constant amount of leads in a competitive market. If you are in a larger city or a more competitive market, you might want to turn to PPC to generate leads right away. The challenge is law firms have the largest CPC averages across all industries. Understanding whether you should use paid ads is complicated. The challenge with PPC for attorneys is the high costs. 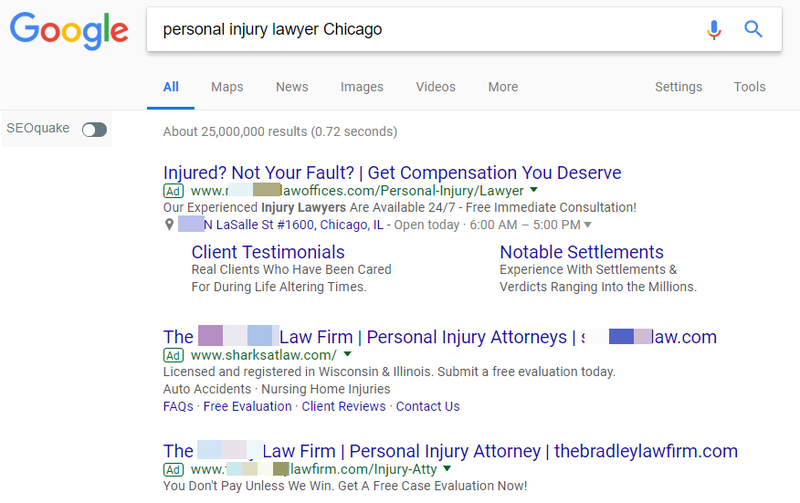 For example, if you practice personal injury law in Chicago the average CPC, according to SEMRush is $61.01 for the keywordpersonal injury Chicago.At the same time, personal injury lawyer Chicago is $93.12 per click.On the flip side,car accident Chicagohas a CPC of $7.21. The question becomes how many clicks before you get one lead? Assuming you have a fantastic website and reviews, you might need about 4-6 clicks before you get a lead. That means you could spend between $372.48-$558.72 on a qualified lead forpersonal injury lawyer Chicago. To be clear, this is not a paying client, it is a prospective client. The question is whether it is feasible for an attorney with a $1000 budget to use paid search for 2-3 prospects per month? The answer depends on your niche. If you are a real estate attorney who earns $1500 on residential closings then probably not. However, a personal injury attorney might find paid ads profitable. Let’s run the numbers to explore how a PPC campaign could help a personal injury attorney. According to Lawyers.com, the average personal injury case in the United States is $52,900. To be conservative, let’s say your contingency fee is 33%. Your portion of the settlement would be $17,457. Assuming you close 1 out of every 10 prospects, by the end of the year you could have 2-3 new clients. With two closed cases in a year, you would gross $34,914 on a $12,000 investment. That is a 290% return on your investment. A real estate attorney would only make $3000 in the same period with paid ads. It is a stark reminder that without knowing more about your niche, local market, or budget,it is impossible to tell you whether you should use SEO or PPC for your marketing strategy. If you need help analyzing your competitors and niche, we offer a free competitive analysis auditthat reviews the pros and cons of using SEO vs PPC for your strategy. Unless you have licenses from multiple bar associations, you need customers in your state. The best search strategy is Google Local (Google Map) search. The results in Google Local used to be all organic. Over the last few months, the search engine launchpaid local search ads. While ad results are a little premature, it should work similar to the other ad programs on Google AdWords. For the past few years, one of the best ways to get local organic traffic was through Google Maps. The process requires setting up a Google My Businessaccount. Over time as you collect citations for your law firm and build up reviews, it can be a powerful long-term revenue driver for your firm. However, like other areas of Google, it takes time. The benefit of Google local is you do not have to compete against the whales in your industry as you do with traditional search. Instead, you face off against local law firms. As we mentioned, paid ads on Google Maps started a month or two ago. It is too early to analyze the results. However, it benefits small to medium firms who can create ads that don’t compete against larger law firms who pay large sums of money for keywords. Even in huge metropolitan areas like Chicago, New York, and Los Angeles, your competition for these ads is less. The new ad space could also relieve some of the costs in the industry by matching the supply to the demand. Before we go into this section, we know that most attorneys never want to lift a marketing finger ever again as you get your first lead two seconds after your site goes live. In this scenario, your site continues to pump out leads until you retire. Now, if you have unlimited funds to do this, then we can make this happen. 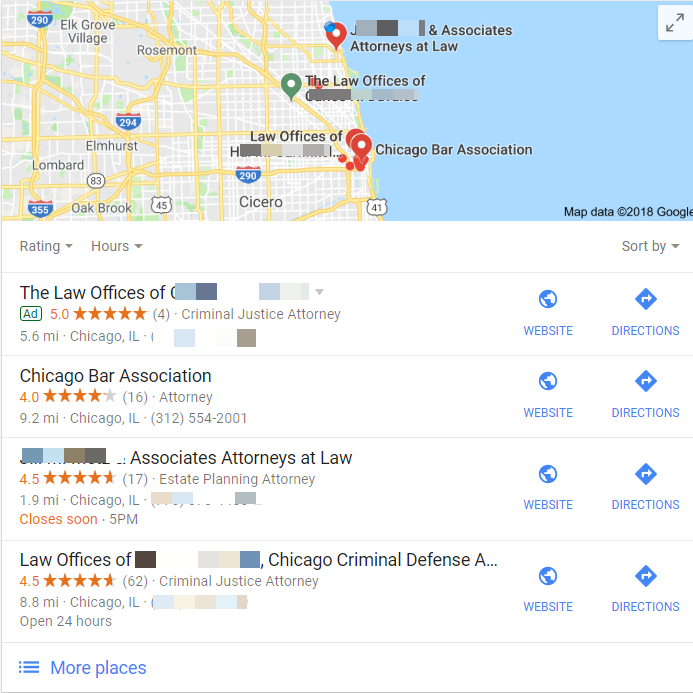 However, if you are a small to medium sized law firm with between 3-25 attorneys and additional support staff let’s explore options between the long-term SEO benefits versus the short-term PPC gains. If you want to build established brand customers can trust, search engine traffic can help you with this goal. Furthermore, using SEO strategies like content creation, link-building, and user experience mean you can grow your firms’ traffic for years without having to work as hard or pay as much as you would with PPC campaigns. Often it takes 6-12 months to generate enough traffic from SEO to drive quality leads. However, when you do rank for the right keywords, you can sustain your company on those leads. All it takes is the right strategy and team. Ryan Deiss of Digital Marketer stated, “traffic is a commodity.” Any firm can drive traffic to their website as long as they have a large enough budget. The key to this commodity is to get the right traffic. If your law firm needs to grow today because you do not have enough cases, then PPC is a quick strategy to build your caseload. The downside is when you paid for traffic it becomes a never-ending cycle. If you want to gain the advantage on your competitors, then you need to explore how SEO and PPC can help your firm grow. If you want to know how you compare to other law firms then request schedule a free consultation with our team today, so we can produce a complimentary audit to determine whether you should use SEO vs PPC.